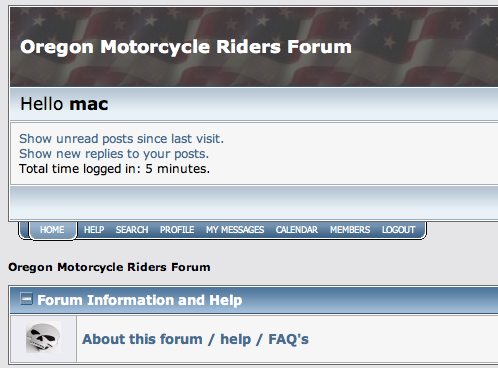 The Motorcyclist Advisory Council (MAC) is once again looking for rider feedback. They want highway rider input from across the U.S. and your answers to the survey will be used to help state and federal highway administrators better understand and plan for the needs of motorcyclists. The survey can be accessed HERE until August 1, 2009. Note that the questions are separated into 3 distinct rider settings typically experienced by most motorcyclists: Urban Areas (city/suburban/frequent intersections/pedestrians); Rural Areas (fewer intersections/higher speed); and Limited Access Areas (freeway/highway/toll road/minimal intersections). The survey will ask you to consider these settings carefully when answering the questions as riding experiences vary significantly in each domain. A comments section is included at the end of each page to highlight anything you may feel was overlooked, but I doubt my comment on removing advertisements and bill boards alongside county roads will get much attention. The survey takes less than 7 minutes so, give it a go. Screen shot courtesy of Survey Monkey.